The location was part of Gillibrand’s efforts to carve out room in the crowded 2020 Democratic primary by painting the biggest possible contrast with Trump. But it could also have a more immediate side effect: a tweet or some sort of other reaction from the impulsive president, a massive potential boon for a campaign that has yet to gain traction in polling of the presidential contest. Gillibrand has also faced criticism over the handling of a sexual harassment claim in her Senate office, when a former staffer resigned in protest over the office’s handling of her claim, which POLITICO first reported earlier this month. Taking on Trump more directly might provoke just that. That kind of attention, whether from the president or from national Republican groups, served as rocket fuel for a number of Democratic candidates in the recent midterm elections, said Dan Sena, the former executive director of the Democratic Congressional Campaign Committee. But Gillibrand also said that she’s “not running for president because of who I’m fighting against,” but “I’m running for president because of who I’m running for.” She reiterated themes that first appeared in her announcement video — “brave wins” — and worked to turn the page on the first two months of her presidential campaign. The senator was joined on stage by activists, including DREAMers, anti-gun violence advocates and victims of sexual assault. It was a line-up reminiscent of the Women’s March, a movement that Gillibrand has tapped into for her presidential campaign. Gillibrand retold much of her own political history, starting with grandmother, Peggy Noonan, a fixture in upstate New York politics, who taught her “that being brave doesn’t only mean standing up for yourself, it means standing up for other people who need you,” she said. She charted her own path through politics, from winning in a “red, red, red district that nobody thought I could win,” to her work passing a health benefits law for 9/11 first responders and trying to reform how the military handles sexual assault and harassment. “Find me any unsolvable problem, and I’ll point to the greed and corruption standing in the way,” Gillibrand said, adding that she won’t accept corporate PAC money, federal lobbyists money and no individual super PAC. She also said she would advocate for publicly funded elections. On policy, Gillibrand sounded progressive notes that she’s talked about frequently on the campaign trail, from a national paid family leave program to the Green New Deal, calling it “this generation’s moonshot” and promising to tax the use of carbon. To observers, it appeared that Gillibrand’s choice of location for her speech meant she wasn’t waiting to try and change the campaign. 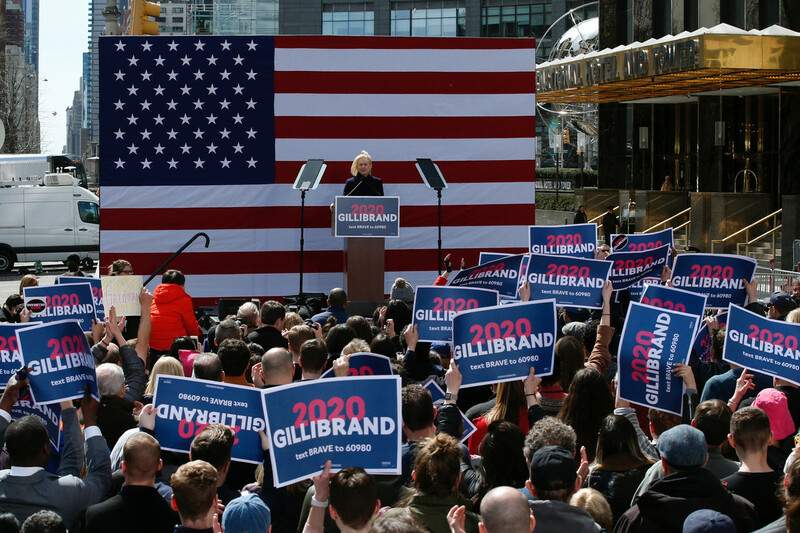 But even among the New Yorkers that rallied with Gillibrand on Sunday, several said it was still too early to commit to one candidate.